Most people don’t quite understand the dynamic of aesthetics… They are in a constant process of thinking they need more and more muscle. But, that’s not always the case. Sometimes burning some fat and playing with your waist to shoulder ratio is all you’ve got to do. Here are some supplements that can help your aesthetic quest! Getting that big, dry, solid muscle look referred to as aesthetic bodybuilding status is one of the greatest accomplishments in bodybuilding as well as one of the greatest social assets. After all, building muscle in the gym is difficult enough for the majority of the human population. So the idea of both building well balanced muscle and moderating fat composition is only accomplishable for a very few group of individuals. 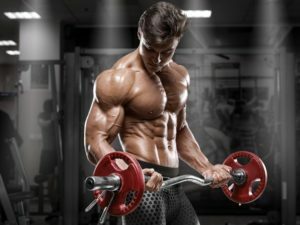 The idea of focusing on aesthetic bodybuilding and supplementing to meet the needs of aesthetic bodybuilding is all about going beyond the call of action. Your mindset needs to be perfect. Every time you go to the gym, you cannot be satisfied with any other person’s results because your goal is far beyond theirs. The pursuit of aesthetic bodybuilding developed hundreds of years ago. It was the Greek people that first appreciated the muscular human body, idolizing the idea of perfect aesthetics in statues. Set your priorities straight, get your meal plan in order, and get the job done. To help you, here are the best supplements for getting that aesthetic look the right way. Note: Supplements help, but in order to get the ‘best’ body possible, you’re going to need to double-time your focus on eating good foods, as well as sleeping like a bear. After all, most of the aesthetic legends that you see are only able to achieve these bodies by using steroids. You on the other hand, will have a harder road as a natty, but the reward is bigger. Pro-Tip for that aesthetic look: Sleep 7+ hours a night and practice intermittent fasting. I know, you are here for supplements. But the reality of the situation is that your diet will play a far larger role in getting an aesthetic body than supplements ever will. Without a good diet, supplements are worthless. With that being said, you need to find out exactly how many calories you need on the daily in order to build an aesthetic body. See, the biggest thing that separates the ‘aesthetic look’ from regular bodybuilding is fat percentage. Aesthetic bodybuilders always have an extremely low fat percentage, which makes their proportions look better when they train. So what do you do? Plan on tracking your calories and developing a diet plan. For me personally, intermittent fasting is key. Basically, from sunrise until about 6 pm, I eat nothing – Just water and black coffee. Then, at 6 I eat a meal, hit the gym 3 hours later, and then afterwards eat another massive meal. This puts my daily feeding window into roughly a 6 hour period, where I take in close to 2,000 calories. I plan on writing a detailed guide for this type of dieting soon, as the results have been killer (expect around 6/15/18, stay tuned). This is shocker round two. I know what you’re thinking… Vitamin D, wtf? Well, I suggest you read this article summarizing how Vitamin D increases strength, promotes muscle growth, and reduces body fat. All of these benefits for literally under $15 a month, that’s a no brainer and this should be at the top of your list if you’re not out in the sun daily. The third most important thing for you to be taking while seeking to achieve an aesthetic body is a pre workout. 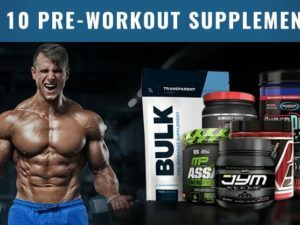 I chose this, because pre workouts are one of the most effective ways to increase workout intensity, reduce gym days skipped, and also enjoy the gym more. You can view our top rated pre workouts here, this is what we take and recommend. Cutting down on your calories if you’re on the heavy side isn’t easy. But, a fat burner can help with ease of fat loss, as well as suppressing appetite. Pretty much any stimulant is good at suppressing appetite, so if you are broke as heck – increase your intake of black coffee. It works wonders for taking away food urges. However, if you have the cash to spare, a high quality fat burner can make a noticeable difference. Think of it as insurance to make sure you burn calories, even if your body doesn’t want you to while dieting (yeah, sometimes the body will revolt even when you cut calories). Zinc and Magnesium are mega-essential for the body, especially when you train. This is a similar situation to the Vitamin D report, and you can learn more about ZMA as well as see our top ZMA supplements right here. When you take your ZMA supplement, take it at night. The magnesium will relax your muscles and make falling asleep easier. Double win. Of course you are going to want to ensure that you are meeting your daily protein needs. How much is that? Well for me at 195 lbs currently, I shoot for at least 125 grams of protein per day and everything has been going fine. Yes, you can go above that for better results, but it’s a convenience thing. Does that mean you’ve got to be taking 125 grams worth of protein powder on the daily? Absolutely not! Take protein shakes in order to elevate your daily protein levels, not to encompass them. What that means is, get all the protein you can through meat, fish, and eggs first. THEN, reach for the protein shakes to ensure you are above 100 g per day. When do you take your protein or BCAA supplements? I normally drink a scoop or two of whey isolate with my post workout meal. If I know I’m going to be training hard, or skimped out on my first meal of the day, then I’ll consider taking some BCAAs before my lift with pre workout to keep muscle growth primed. But besides that, you won’t catch me drinking protein and BCAAs all day. I prefer to slam them all in one sitting, ensuring that my body has the least number of insulin spikes per day, so that my growth hormone can rocket and fat-metabolizing hormones can be plentiful. If fast food, processed TV dinners, and ketchup as a vegetable – you will never build an aesthetic body. Prove us wrong, if you can; we’ll give you a few years. Now, when it comes to talking fruit and veggies all we have to say is – eat them. To find out more information on healthy meals and things of the sort, you will need to look else ware because we know just enough to take care of our own bodies, not yours and ours both! Heck, sometimes we don’t know what we’re doing at all, but you better believe we will be picking up green things (sometimes vegetables we can’t even identify) at the grocery store and eat them raw or lightly steamed. The bottom line is, just eat the stuff. Don’t evaluate it, or search for some secret trick to cheating the greens, just fulfil the motion and get the suckers down. Got questions? Ask away below in the Facebook comments section. Remember, most of this is going to come down to your diet. So be mindful when looking for shortcuts… There really are not any unless you plan on taking the cheat route and juicing up. We’re not willing to live with that tradeoff.